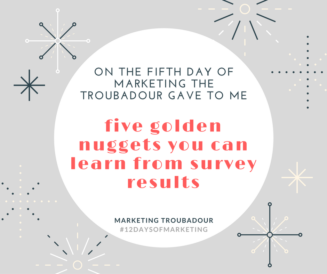 FIVE golden nuggets you can learn from survey results. 1) what people really think of your customer service, 2) why customers buy from you, 3) what clients wish you did better, 4) what are the most important purchasing criteria, and 5) if they would recommend you to others. A few pointers about performing surveys: tell people your objectives of doing the survey, why you need the information, how you’re going to use the information (to improve their customer experience ultimately), and how grateful you are to get their important feedback. Giving people an extra incentive (besides just being heard and being helpful) is a good idea. The incentive does not have to be large, or even given to each respondent, but it may increase participation. You could even offer an entry for a drawing for each survey completed and have one larger prize to give away. So if you’re wondering whether doing a survey is worth it, try it!